Is it that time of year again? Yes it is. What a time to be in Melbourne! Weather, Aussie Open Tennis, International cricket, Poker at the Crown… what more could you want? 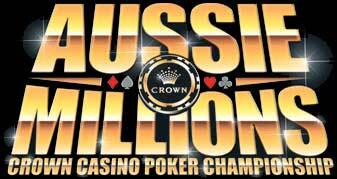 Aussie Millions 2011 is here. Event #1 – $1,100 No Limit Repecharge Event saw 1000 players ante up for a $1 Million prize pool. Good times for the Main Event. The big names have already started arriving. Event number 8 – the 100k Challenge and Event number 9 – The Main Event, is what everyone will be talking about. They start on the 22nd and 23rd of January respectively. All Aussie Poker has put together a list of sites which have a number satellites running for you. Australian Poker has a new home - All Aussie Poker - © Copyright 2012 AllAussiePoker.com All Rights Reserved.